Dimensions (HxWxD): 1.85" x .875" x .25"
This stunning 1.85 inch high 30+ carat Golden Angel Hair Rutilated Quartz Cabochon Pendant has an amazing energy to it. 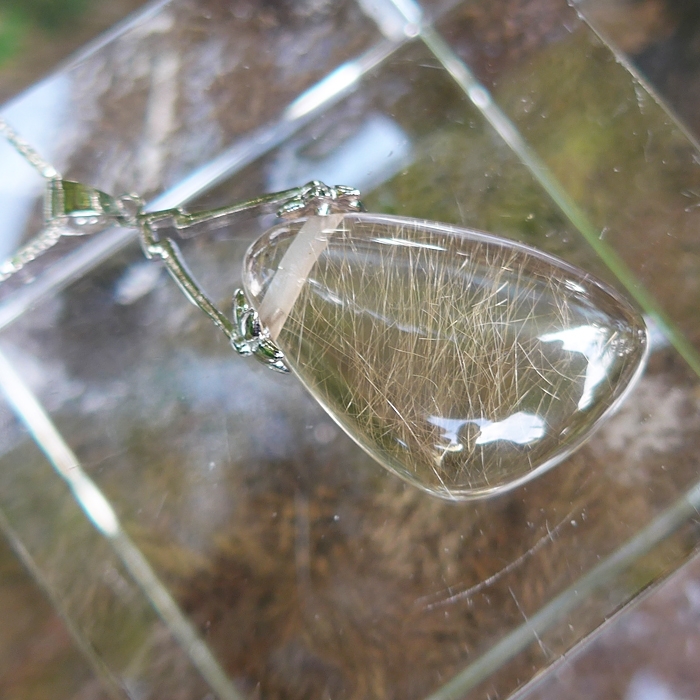 This unique AAA golden rutile cabachon is capped with a sterling silver bale and comes complete with its own 18" long sterling silver chain, in a velvet jewelry box. The back side of this pendant is flat so it will sit properly on your chest. We are proud to offer our customers custom-designed, hand-made crystal pendants -- made by Satya -- that come from fine American jewelers in New York City and Boca Raton, Florida, whose work is demonstrably of the highest quality. Jane and I selcted a small number of golden rutile stones from trays of hundreds we inspected, picking only those stones with a powerful energy signature and mineralogical interest. 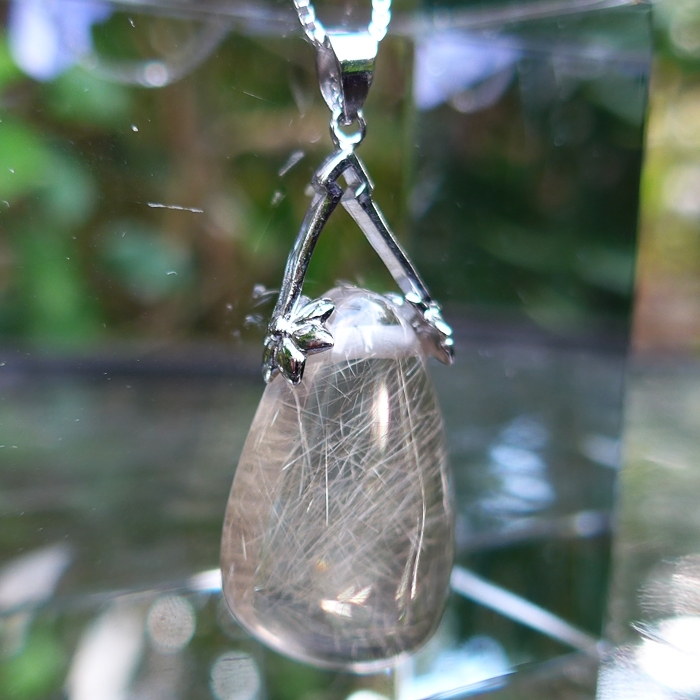 We had this gorgeous rich golden rutile pendant set in a unique handmade sterling silver setting which was custom created for Satya Center by a very talented Boca Raton jeweler, located in this legendary resort town, north of Ft. Lauderdale and south of Palm Beach. 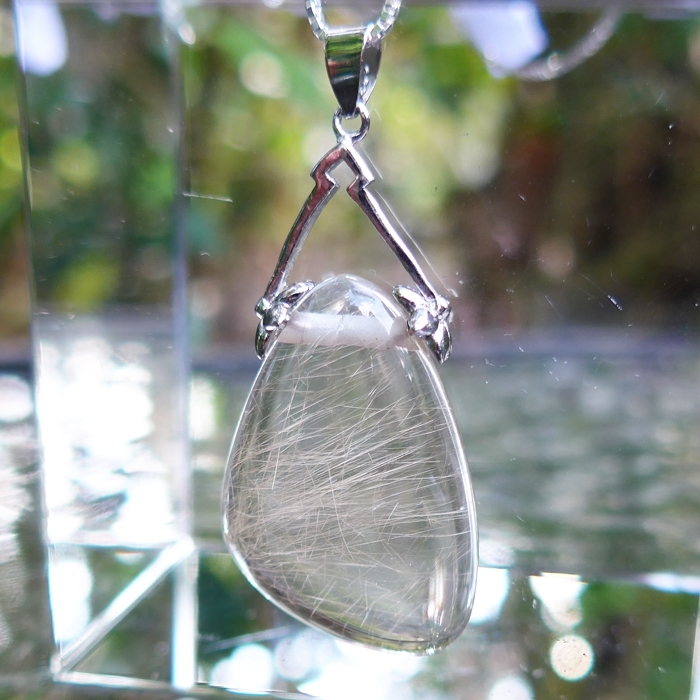 Rutilated quartz pendants, in my experience, when used in crystal healing, Reiki, or meditation sessions, act as a stimulant to the nervous system and the etheric body. Note: Above weight is shipping weight. Net weight is 7 grams, excluding chain. Net weight of cabachon is approximately 30+ carats.